Summer is (sadly) drawing to an end and I'm going to miss the opportunity for my daily morning laps at the pool. Earlier this summer I made myself a simple drawstring backpack for carrying my goggles, sweatshirt and hat to the pool each morning. A simple backpack with a twist. The twist is the hidden pocket that you can see at the bottom of the photo above. I tuck my phone in that pocket and keeps it nice and safe. Here's a view of the hidden pocket during construction. 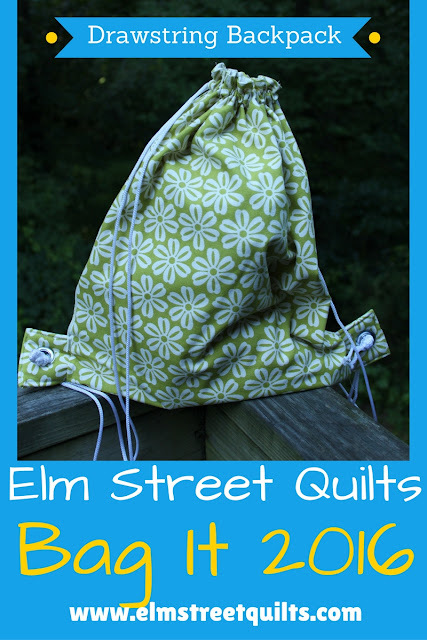 A tutorial for the drawstring backpack will be featured during the Elm Street Quilts Bag It event - complete with grommet installation! What is Elm Street Quilts Bag It? This blog event will kick off Monday September 12 with a week long introduction to all the fabulous sponsors. Then, the tutorial begin - weeks and weeks of new tutorials of all different kind of bags. Making a bag during the event - from my tutorial, some else's tutorial or from a pattern etc - earns you participant entries towards the giveaways. If you needed incentive to get some handmade holiday gifts made, this is it! You can read more about the overall event on the information page. I'd love your help in building a listing of great bag tutorials. Link up your bag tutorial from your blog - doesn't matter when the blog post went live as long as it contains a link to this tutorial page so people can find other bag tutorials. New tutorials shared in a blog post September 1 through November 15 which contain a reference to Elm Street Quilts Bag It linky party, will earn you an entry into the overall entry bucket. And I'll be searching for featured bloggers during Bag It from all those who enter a tutorial into the linky. I love my new bag and can't wait to share the tutorial for this bag and a whole bunch more!! I'll be linking my finish with Fabric Frenzy Friday, Finish it Up Friday, Finished or Not Friday, Sew Cute Tuesdays, , Freemotion by the River, WIP Wednesday's, Let's Bee Social, and Midweek Makers. I had trouble with the Bagit button this morning. Maybe it is my old PC griefing me again. I am late posting the OMG Linkup, and wanted to include it. I will find and rip a photo for now.. I like that secret pocket - good idea! Too bad your swimming is coming to a close. Guess you'll have to move to a year round pool, as I'm swimming at 5:20am, even in the winter. And you should hear the guys complain about during their short walk to the locker room! What a great handy idea, that secret pocket. Getting excited for the Bag Hop. nice bag ! looking at your picture of the grommet installation makes me think that having the right tools would make the job easier - unlike the way I did it when I was making a pencil case for a 3 ring binder ! Cute bag with it's little pocket! Patty, that's the coolest bag. I love the hidden pocket! Great job w/the grommet install...I finally learned it myself and didn't hammer my finger in the process.